IF YOU HAVE ENJOYED THIS SITE - BUY ME A COFFEE! Simply click on the link below and you can enter a gallery containing a step-by-step account of how a 'royal binding' takes shape. Please feel free to email Paul: tronson1@gmail.com if you have any comments or would like to make an appointment for a book consultation. The Secrets of the Grimoire of Angels is published separately. Access to the Grimoire of Angels is available to enquirers upon request who will then receive a user name and password to keep to themselves. Email periodfinebindings@googlemail.com with an introductory note and reference. "Next Page" at the bottom of each page. Two Royal Bindings Bound by Paul Tronson. Binding Books & Royal Bindings - First Complete English Edition of Cervantes Don Quixote in the two parts. 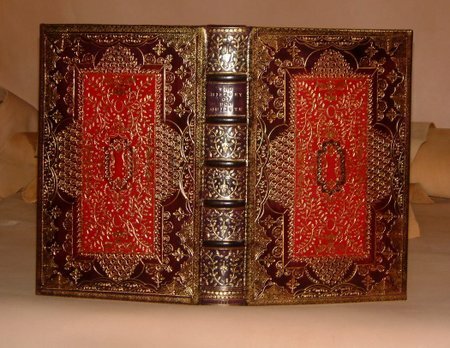 My choice of binding for this 1st ed of Don Quixote was originally in a "Spanish Renaissance" style, but the client insisted on the same style as the Dugdale binding, even though the book was much smaller!.....Ahh well! We aim to please. 1644 Last folio Geneva Bible and the 2nd ed of the large folio Great Shee Bible. Restored and bound by Paul Tronson. The Great Shee Bible. the genuine 72 line 2nd edition, restored and rebound by Paul Tronson. The Grimoire of GOD....Probably the most ambitious Grimoire I have ever done...The recto side angelic and the verso side a demonic mirror image. The design is created using more than 5000 impressions of straight lined tools of different sizes (pallets) and curved tools of different sizes (gauges). Also used were a 6pt, 8pt, and 10pt letters and a tiny pentagram. Paul Tronson has been known for over 3 decades as a world leading conservator and traditional bookbinder. Still building and restoring private investment libraries 36 years on! Period Fine Bindings 1983 to Infinity All rights reserved. Restoration of antiquarian books using original formulae and traditional skills to period styles.